• Stay 3 Nights and Pay 2 Nights on best available rate. • 30% Discount on Food & Beverage. • 30% Discount on Angsana Spa. • 30% Discount on Laundry Service. Offer valid from today until 12th February 2019. Promo code: CQVROM2019 to be mentioned upon booking. For reservation, please call at 4434 3112 / 3114 for more details. Copyright © 2016. 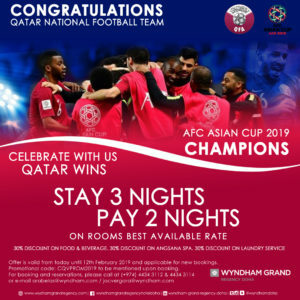 All rights reserved to Wyndham Grand Regency Doha.